I honestly rarely eat pasta. I avoid it because it has so many carbs and is just too many calories. 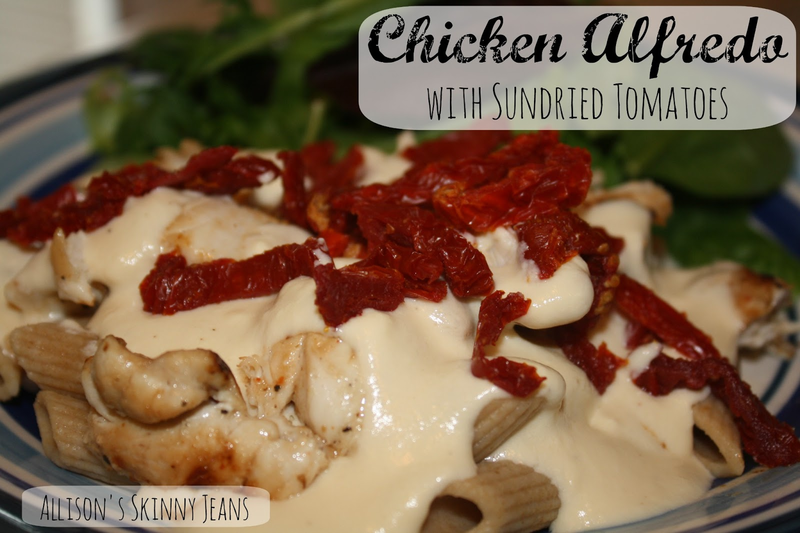 Sometimes I just want a pasta dinner, so I recently came up with this recipe for Chicken Alfredo with Sundried Tomatoes. For a pasta dish - it is lighter in calories and filling! It's also made with whole wheat pasta - so at least the carbs are complex. My mom came over to watch the Bachelorette with us, so we had a 'Build Your Own Pasta' night. Cook the noodles according to the package. Heat your sauce (or both). While the noodles are cooking, grill the chicken tenders and shrimp. I marinaded my chicken in a ziploc bag with olive oil, salt, pepper, and light italian dressing. Once the chicken is grilled, I slice it up into large pieces to put on the pasta. If you are using shrimp, put them on wooden skewers and grill them for about 3 minutes on each side. Make sure you soak the wooden skewers in water so they aren't a fire hazard. Build your pasta! I made mine with the alfredo sauce, chicken, and topped it with the sundried tomatoes. Enjoy with a salad on the side! My husband added alfredo sauce and shrimp to his!